Mazus pumilio is a small, low growing native herb that is common in swampy places. 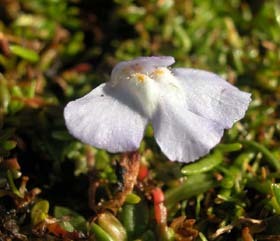 The flowers are conspicuous, and are often the most obvious part of the plant. They show strong bilateral symmetry with a very large, three-lobed lower lip and small upper lip. The leaves are clustered in a basal rosette. 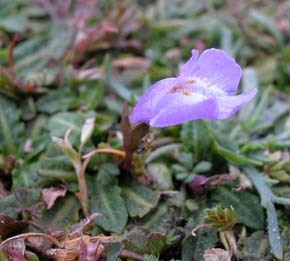 Mimulus repens is another mauve-flowered member of Scrophulariaceae that grows in swampy places, but has elongate stems and much less asymmetrical flowers.